Size: up to 2 feet or more. Growth Form: Forb/herb; erect, spreading, multiple branches or unbranched, milky sap, rhizomatous herb often seen in large stands, fine hairs. Leaves: Green, 3 or 4 leaved whorled, blades narrowly lanced shape, linear, short petioles or sub-sessile, margins rolled under or revolute. Flower Color: White, greenish or purplish; star-like flowers in umbels from lateral and upper leaf axillaries, one or two umbels developing from each axil, fruit is a follicle. Flowering Season: May to September. Elevation: 2,500 to 8,000 feet. Habitat Preferences: Sandy plains and mesas, common along roadsides. Recorded Range: Horsetail Milkweed is found in the central western and southwestern United States in: AZ, CO ID, KS, MO, NE, NM, NV, OK, TX, UT and WY and northern Mexico. In Arizona, Horsetail Milkweed in found throughout much of the state with few or no records for Maricopa, Pinal, La Paz and Yuma Counties. North America & US County Distribution Map for Asclepias subverticillata. 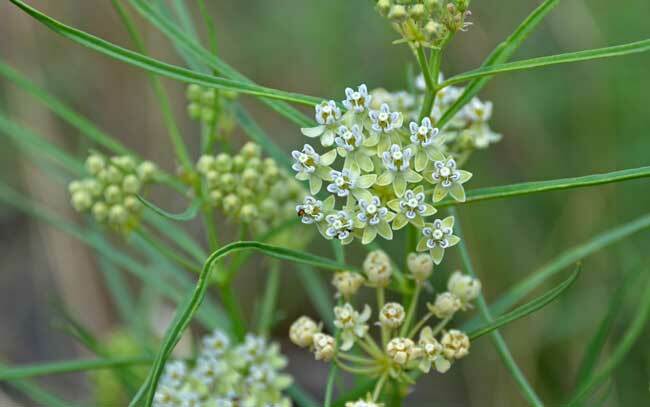 U.S. Weed Information: Asclepias subverticillata is listed in: Weeds of the West. Plants included here may become weedy or invasive. Wetland Indicator: Asclepias subverticillata is included on the USDA 2012 National Wetland Plant List. Genus Information: In North America there are 76 species and 91 accepted taxa overall for Asclepias. World wide, The Plant List includes 215 accepted species names and includes a further 122 infraspecific rank for the genus. In the Southwestern United States: Arizona has 29 species of Asclepias, California has 18 species, Nevada has 13 species, New Mexico has 26 species, Texas has 38 species, Utah has 17 species. All data is approximate and subject to taxonomic changes. Comments: Horsetail Milkweed is an important nectar source for several insect species. 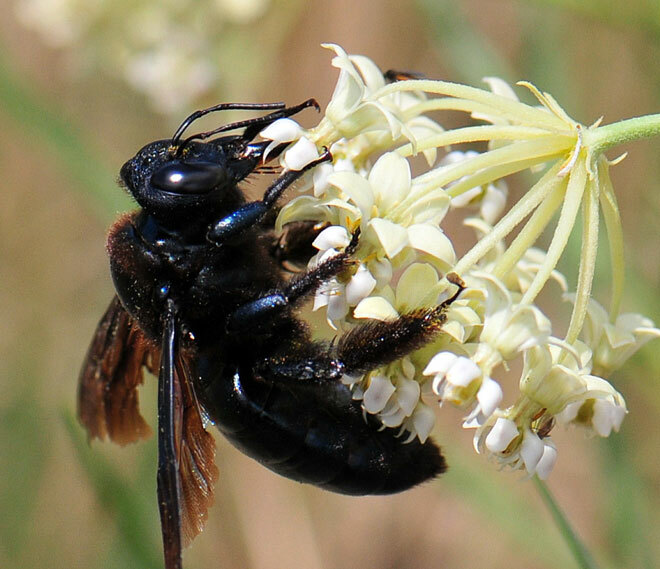 The Great Black Wasp, Sphex pensylvanicus and Carpenter Bees (Xylocopa sp.) 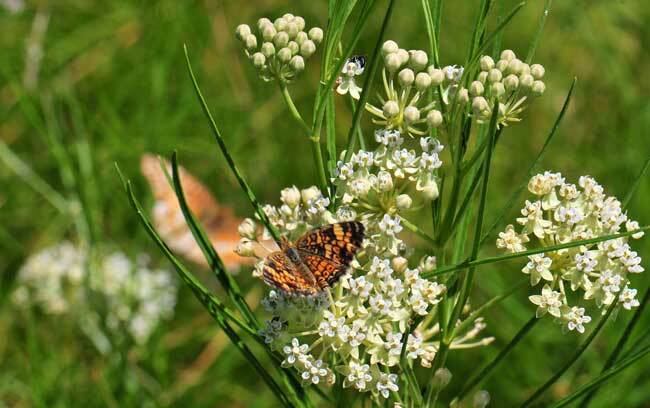 are important pollinators for several species of milkweed. See photos above. 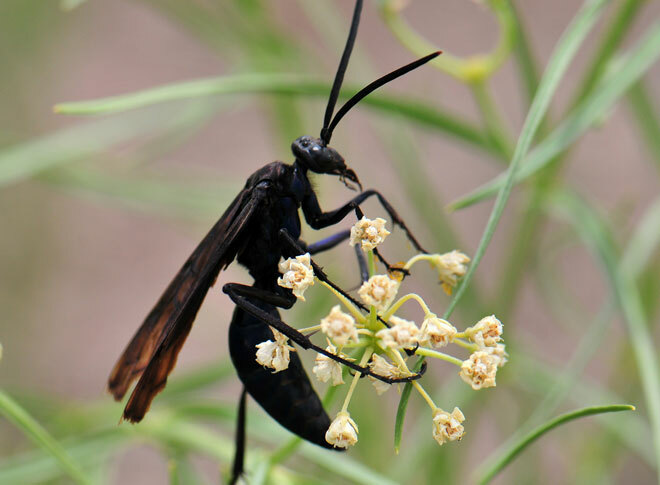 Horsetail Milkweed has poisonous properties to livestock and Arizona Flora reports "this dangerous weed should be eradicated from pastures and ranges whenever practicable". Also see in Southwest Desert Flora; Arizona Milkweed, Asclepias angustifolia, Antelope Horns Milkweed, Asclepias asperula, Mexican Butterfly Weed, Asclepias curassavica, Dwarf Milkweed, Asclepias involucrata, Pineneedle Milkweed, Asclepias linaria, and Rush Milkweed, Asclepias subulata. Horsetail Milkweed has been used as gynecological aid. 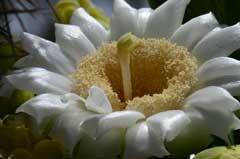 See other ethno-botanical uses at Native American Ethnobotany, University of Michigan, Dearborn. The Plant List (2013). Version 1.1. Published on the Internet; http://www.theplantlist.org/ (accessed 10/16/2016). Arizona Flora, Kearney, Thomas H., Peebles, Robert H., 1960, University of California Press, Berkley and Los Angeles, California. Native Plant Information Network, NPIN (2013). Published on the Internet http://www.wildflower.org/plants/ [accessed:12/2/2014]. Lady Bird Johnson Wildflower Center at The University of Texas, Austin, TX. 2002, The Jepson Desert Manual; vascular plants of southeastern California, Baldwin, Bruce G., et.al., University of California Press, Berkley and Los Angeles, California. SEINet for synonyms, scientific names and recorded geographic locations, http://swbiodiversity.org/seinet/.